Go Orange for No Kid Hungry! The house smelled so good when the kids arrived home from school on this particular afternoon! After taking some time off from my blogging this past week, I’m sliding back into my regular routine. As I often do, next week I’ll begin blogging some great toy and gift reviews from the holidays. I’ll continue this during the month of January in order to give you some gift-giving ideas for the rest of the year, but before I do, I thought I’d put out a new Fun Friday recipe for you. Today is Friday and it’s still school vacation, so there’s lots of time to relax and do some fun things together before heading back to the school routine. I love school vacation weeks exactly for this reason. We get to do some fun things that we normally don’t have time for during the craziness of the school year. This is a perfect recipe to try out today. It’s a great recipe for little hands to help with (or for bigger hands to complete on their own) and it’s warm and delicious. The recipe comes from Megan Zietz over at The Frugalista Diaries blog, but I actually saw it on another blog where she was guest blogging for the day. The ingredients and directions are simple and quick, making it a perfect after school snack, dessert or school vacation day treat. Megan made a note (see below) that she used Immaculate Baking Company’s crescent rolls. I did not have those on hand but I did use a lowfat version of another company’s crescent rolls. I also skipped the vanilla ice cream since I was using this as an after school snack, but if I were making them for a more involved dessert, I’d definitely put ice cream out. These all got thumbs up. There were eight crescents and five people here, so next time I’d definitely do two packs of crescents to double the recipe. I think you could also throw in some dried cranberries or some raisins to this recipe, and I bet it’d be great. I hope you’ll visit Megan’s blog. She’s got lots of great posts on there and she covers more than food, so pay her a visit! 1. Roll out the dough on a greased cookie sheet, brush with butter and sprinkle Brown Sugar and Cinnamon in individual pieces of dough. 2. 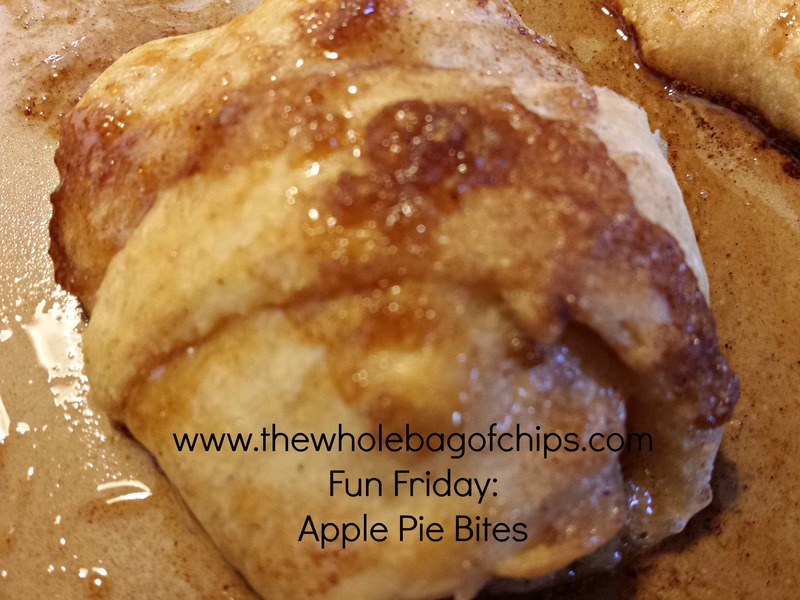 Roll up an apple slice in the dough forming a crescent, brush with melted butter and top with cinnamon. Repeat for others. 3. Bake for 12-15 Mins at 350˚. 4. Remove from Oven, filling will be hot! Serve alone or with a dollop of Vanilla Ice Cream. Categories Select Category After School Snacks Appetizers apples April Fools Day April Vacation Week Baby Notes Bella Birthdays Blog Awards blueberries books Breakfast recipes Breast Cancer Awareness Month Camping Cave Tools chocolate chips Chrismas Crafts Christmas Christmas Cookies Christmas Stories college Cooking with Kids Couponing crafts for kids cranberries Cranston Herald Crock Pot Recipes Cross Country Vacation 2015 dairy free dessert Dinner dinner recipes Easter Eating on a budget education Epicurious Recipe Contest fall fall desserts Family Movie Night Family Road Trip Father’s Day February Vacation Week Giveaways gluten free Go Orange for No Kid Hungry Graduation Halloween Hanukkah healthy Hershey’s Hershey’s Kisses I’ll Always Be There Instant Pot Meals Instapot Meals Jennifer L. Cowart Kids Kitchen Renovations Lent Lenten Meals Lexus Eco Challenge Little Free Library low fat Lowfat/Nonfat lunch Memorial Day Monday Musings Mother’s Day Motherhood Mystery Rides New England Press Association Awards Paper crafting Parenthood Passover peaches Pi Day Product Reviews Providence Journal Pumpkin Palooza Purim Recipes RV rv cooking SheKnows Expert posts Shopping on a budget Side Dishes South Beach Diet St. Joseph’s Day St. Patrick’s Day STEM strawberries Summer Superbowl Week Thanksgiving The Reverse Dinner Party two weeks of meals Uncategorized Valentine’s Day Veteran’s Day What’s for Dinner Wednesday Winter Your tray or mine Your Tray or Mine?